UNITED NATIONS, Jun 12 2018 (IPS) - For most people, the annual G7 meeting may just seem like an expensive photo-op that doesn’t connect with any concrete change in people’s lives. But for us, appointed by Canadian Prime Minister Justin Trudeau to sit on his G7 Gender Equality Advisory Council, it was a unique opportunity to push for strong commitments for girls’ and women’s rights. 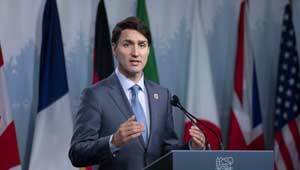 Canada’s Prime Minister Justin Trudeau holds a press conference at the G7 summit last week. We had the opportunity to meet the seven leaders for breakfast and make a strong case for concrete commitments and accelerated action to achieve gender equality within a generation. There is unprecedented momentum and support for gender equality and women’s rights. With the universal adoption of the Sustainable Development Goals, which put gender equality at the center, and the global attention brought by #MeToo and related campaigns on ending sexual harassment and other forms of violence against women, support for improving outcomes for girls and women has never been so high. The explosion of discussions in our offices and shop floors, our boardrooms and locker rooms, our dining rooms and bedrooms must come right to the G7 table. It is therefore significant that leaders spent two hours discussing gender equality and that it was also part of other discussions. As a foundation, it is critical to eliminate discriminatory legislation which persists in G7 countries and around the world. We also called for the removal of barriers to women’s income’s security and participation in the labour market. Concrete measures, such as legislation and implementation of pay equity can close the wage gap between men and women. And the jobs of the future, whether it is in the digital economy or artificial intelligence, must help close – not further widen – the gender gap. Addressing violence against women in the workplace is critical. Employers, shareholders, customers, trade unions, Boards, Ministers all have an obligation to make workplaces safe, hold perpetrators accountable and end impunity. The emerging International Labour Organization’s standard to end violence and harassment at work should be supported to drive greater progress in this area. people all have responsibility to do what they think to be right and just……not to do what Phumzile Mlambo-Ngcuka and Michael Kaufman think to be right and just.